The year 2016 saw the Kenya fifteen -a side team rise to its highest ever IRB rankings at number 22. This occurred after Kenya, coached by South African Jerome Paarwater, won 5 out of 6 tests. There were wins over Brazil, Uganda (twice), Zimbabwe and Hong Kong. Only Namibia beat Kenya. Kenya’s first test of the year was against Brazil. The match was played in Amapa, Northern Brazil. It was the second time the two sides were meeting. The first encounter was in 2011. It ended in a 27-25 win for Kenya. This time Kenya won 18-17 in a tense encounter. With three minutes left, Kenya was trailing 15-17. A late penalty by Darwin Mukidza salvaged a win for Kenya. Kenya scored two tries against Brazil’s one. The tries were scored by David Ambunya and Simon Muniafu, son of the legendary Mad Max Muniafu. 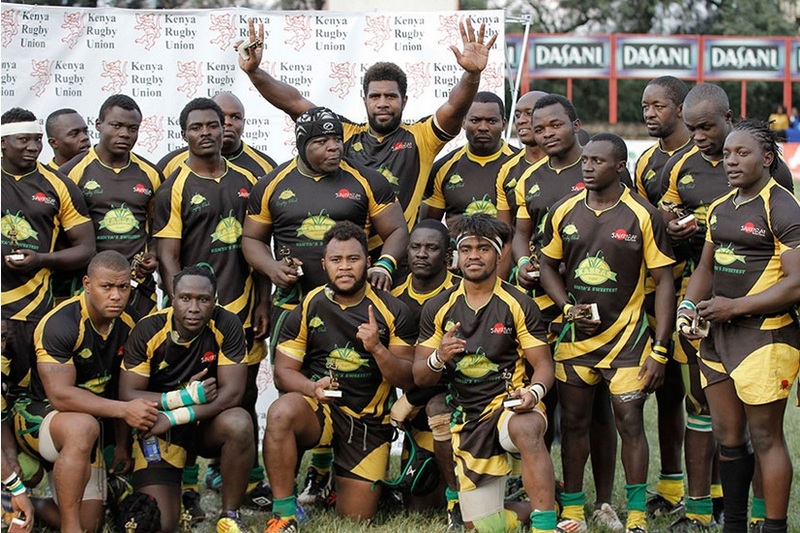 Having accomplished a morale boosting win over Brazil, Kenya took on rivals Uganda in the opening leg of the 2016 Elgon cup. the match was played in Kampala. Kenya destroyed Uganda 48-10. Darwin Mukidza was the star of the afternoon, scoring three tries. Kenya led 29-10 at halftime and with resolute defence, completely shut Uganda out in the second half. The return leg of the Elgon cup also doubled up as a CAR Africa cup match. This time Uganda put up much stronger resistance and led 14-12 midway through the first half. Kenya recovered to lead to lead 23-19 at halftime before winning 45-24. 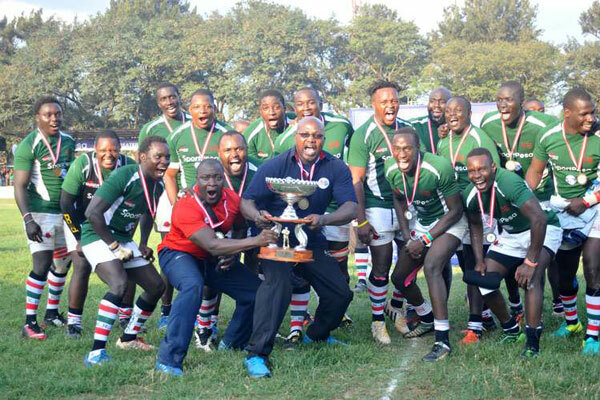 Kenya won the 2016 Elgon cup with an aggregate score of 93-34 to assert their complete supremacy over Uganda and recover the cup they lost in 2015 when Uganda beat Kenya A.
Kenya participated in the top division of the CAR Africa cup. 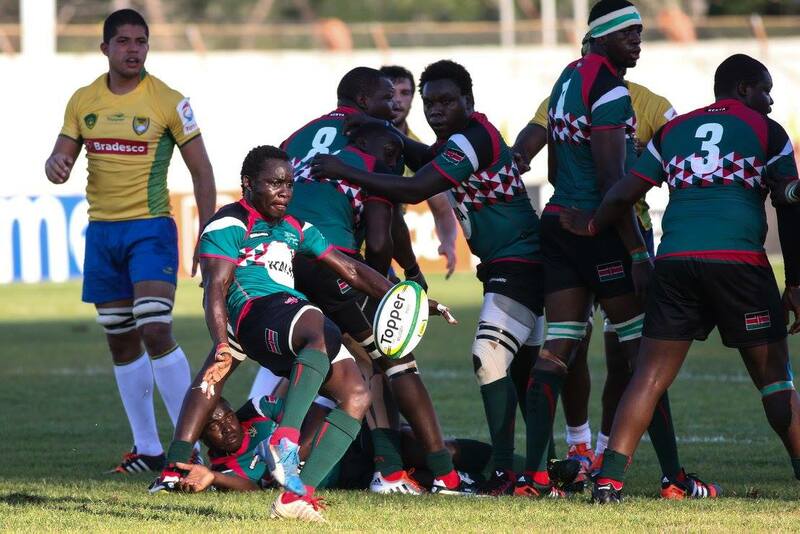 Aside from beating Uganda, Kenya recorded their highest ever win over Zimbabwe, beating them 61-15. As a result Kenya gained a measure of revenge by beating the side that had ruined Kenya’s hopes of qualifying for the 2015 Rugby World Cup. It was also a reversal of 1990s scores when Zimbabwe would routinely beat Kenya by significant margins. The big wins over Zimbabwe and Uganda were tempered by e 56-21 loss to Namibia in Windhoek, which once again showed that Kenya has a long way to travel before they can catch Namibia. Kenya’s last test of the year was against Hong Kong. The two sides had met back in 2011 in Dubai with Hong Kong emerging 44-17 winners. This time, they faced a vastly improved Kenya setup. First it was Kenya A who emerged 28-14 winners over the visitors. Days later, Kenya beat Hong Kong 34-10. 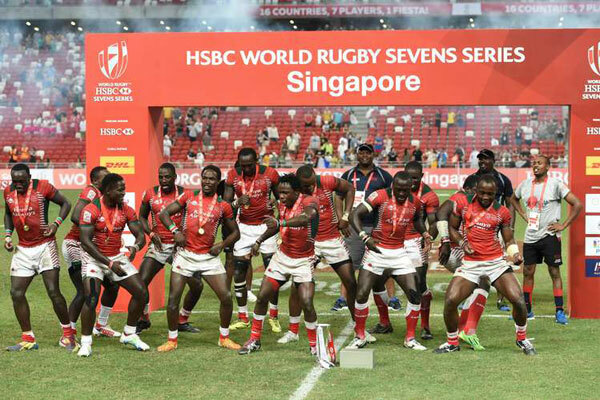 At the time Kenya was ranked at number 24 in the IRB rankings, two places behind Hong Kong. The win enabled Kenya to climb to number 22, the highest ever ranking by Kenya. 2016 marked the first time that Kenya ever won a leg of the IRB sevens series. It happened in Singapore. After finishing second in their group behind South Africa, Kenya recorded a convincing win over France. Then followed a dramatic win over Argentina in which Collins Injera converted a last second penalty to give Kenya a 15-12 win. In the final Kenya beat Fiji 30-7. Collins Injera was named player of the final. Nevertheless Kenya’s performance in the 2015-2016 series was inconsistent. They ended the season by winning the shield in Scotland. Kenya finished 10th overall. Collins Injera became the all time IRB leading scorer with 235 tries. When he broke the record in a 29-12 win over France in London, it was his brother Humphrey Kayange who set him up. Kenya’s problems were blamed on poor arrangements made by the National Olympic Committee of Kenya as well as the fact that Kenya arrived in Rio a good 16 days before the tournament was to begin. This apparently caused the players to relax too much and get into a party mood rather than focus on the task ahead. The women’s side had qualified for Rio after the original qualifiers (South Africa) pulled out. They did not fare any better, losing the three opening pool matches to New Zealand, Spain and Japan. They then beat Colombia 22-10 , a result that enabled them to finish 11th out of 12 teams. In the third place playoff, traditional giants, Kenya Harlequins beat defending champions KCB 36-29 while Impala II won the Eric Shirley Shield after a 19-11 victory over Kabras Sugar. In the KRU National Sevens Circuit, Nakuru RFC’s dominance came to an end as another upstart side Homeboyz lifted their maiden local title after collecting128 points. Homeboyz dominated the series, winning three legs at Nakuru’s Prinsloo, Kisumu’s Dala and newly introduced Nanyuki 7s. They also reached two finals where they lost in Driftwood and Kabeberi. The team went on to produce a huge chunk of players to the 2016-17 Kenya Sevens squad in the likes of Oscar Ayodi, Alvin Otieno, Leonard Mugaisi, Bush Mwale, Cyprian Kuto, and Augustine Lugonzo. In 2016, Kenya rugby lost one of the its most influential personalities. Eric Situma, popularly known as “Stu” passed away after a brief illness. In the mid 1990s, Situma was a player for Impala RFC as well as the Kenya national team where he played at flyhalf and fullback. After hanging up his boots, Situma became a rugby evangelist traveling around the city of Nairobi introducing the sport of rugby to various primary schools. For his efforts, Situma was recognized by both the IRB and Rugby Afrique. In 2015, he was appointed fulltime as Rugby Afrique [former Confederation of African Rugby] regional development officer. Situma was head coach when Nakuru RFC won their first ever Kenya cup trophy. He later relocated to Nairobi and in 2016 he had been appointed coach of Impala RFC, his former team. Situma fell ill while on assignment in Kigali Rwanda. He was flown to Nairobi where he passed away while undergoing treatment at Aga Khan hospital. Two young players suffered abrupt deaths : Nondescripts center Ogeto Gecheo and Mwamba scrum-half Victor Wayodi both passed away while playing in the Kenya Cup. Ogeto passed on at a Nairobi hospital where he was recuperating after suffering a freak injury during the club’s fixture against Strathmore Leos. Wayodi suffered a cardiac arrest during their game against Nakuru RFC which ended 10-10 at the Impala Club and sadly passed on while being attended to at the Nairobi Women’s Hospital in Hurlingham. This entry was posted in Kenya Rugby Articles, Kenya Sports news and commentary. Bookmark the permalink.